QUESTION Will abnormally large or ill-shapen or double yolked eggs hatch? QUESTION Is it an indication of impurity of breeding, for brown-egg breeds to lay eggs of a lighter color? ANSWER – Not always. Heavy and continuous laying oftentimes results in light-colored eggs and it is very common for old hens to produce eggs almost or quite white. QUESTION What causes red spots resembling blood clots, in eggs? 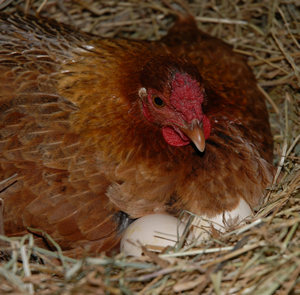 ANSWER – Oftentimes a hen for various reasons will be forced to lay under a strain sufficient to burst one or more of the minute blood vessels in the egg organs or passages and the blood thus liberated comes in contact with and adheres to the egg and the shell is then formed over it. 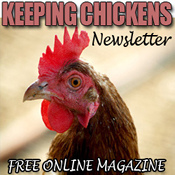 Eggs containing blood clots are generally from over-fat hens. QUESTION How long may eggs be kept for hatching? ANSWER – Set them as soon after being laid as possible. They may be kept from four to six weeks, and even longer, but from two to three weeks should be the limit. They should be turned daily. QUESTION At what temperature should eggs for hatching be kept? ANSWER – Within certain limits a specific temperature is not so important as a uniform one. Anywhere from 50 to 70 degrees is suitable.